Calculation Application Property in VBA represents the calculation mode and returns XlCalculation value. Please find more details about XlCalculation Enumeration values at the end of the chapter. Please find more information about Calculation property in the following chapter. Here syntax for Calculation Property of application object in VBA. Where Calculation as XlCalculation. Please find more details about XlCalculation Enumeration values in the end of the chapter. In the above syntax Application represents object and Calculation is the Property of Application object. 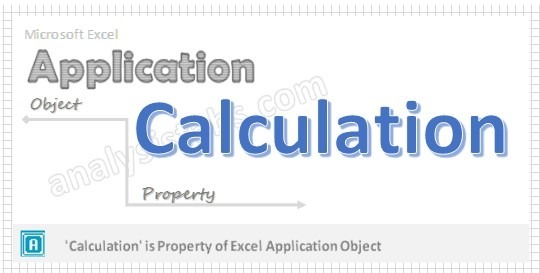 Please find the below example for Calculation Property of application object in excel VBA. When XlCalculation value is xlCalculationAutomatic, It Controls the Excel recalculation. Please find the below example for Calculation Property of application object in excel VBA. When XlCalculation value is xlCalculationManual, the user requests for the calculation. Please find the below example for Calculation Property of application object in excel VBA. When XlCalculation value is xlCalculationSemiautomatic, It Controls the Excel recalculation but ignores the changes in tables. Step 2: Press Alt+F11 – This will open the VBA Editor Window. Step 6: Run the above examples in debug (F8) mode for better understand. Please find the below VBA XlCalculation Enumaration Values, Name and their description.